Kawhi Leonard is focusing on the future instead of the past. The 27-year-old forward, who was limited to nine games last season because of a quad injury, made his Toronto Raptors debut on Wednesday. He scored 24 points on nine-of-22 shooting and grabbed 13 rebounds in Toronto's 116-104 victory over the Cleveland Cavaliers. After the win, the two-time All-Star discussed his return to the court with a new team. "It's one game," Leonard said (via TSN). "I can only see what's in front of me. It's not [about] looking back, saying 'I want to get back to that level [I was at before the Injury]'. It's about right now and what I need to do to be the best player for the Raptors. That's what my focus is." 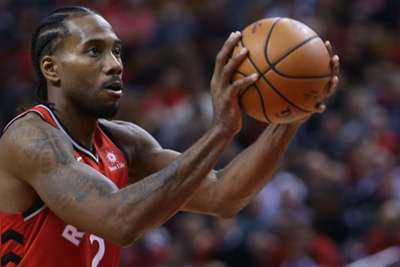 Toronto acquired Leonard, as well as Danny Green, from the San Antonio Spurs for a package centred around DeMar DeRozan in mid-July and he received a loud ovation when he took his new home court for the first time. "It felt great," Leonard said about the cheers from Raptors fans. "They gave me some more energy. I felt the support, and it only fuelled me to play better." Green started and tallied 11 points with five rebounds as well as two steals in his first game in Toronto. The Raptors will return to the court against the Boston Celtics on Friday.